Are you involved in event planning for a local government or organization? Do you have a burning desire to be more sustainable and have less of an impact on the planet? Are you simply a citizen who cares? Look no further! Here are some simple ways to make your event more earth-friendly. Yes, styrofoam is cheap--but its environmental costs are very high. Styrofoam can stay in an environment for over a million years, and can choke unsuspecting animals when it breaks down. Consider having your vendors change to dishwear made of compostable, renewable materials--like bamboo or plant fiber. Even plain-old cardboard or paper dishes (as long as they are not dyed or laminated) can go into most composting facilities. Plastic, like styrofoam, stays in the environment for ages--and it never truly decomposes, instead breaking down into smaller and smaller plastic particles. Have vendors skip lids and straws, and use things like bamboo skewers instead of plastic cutlery. 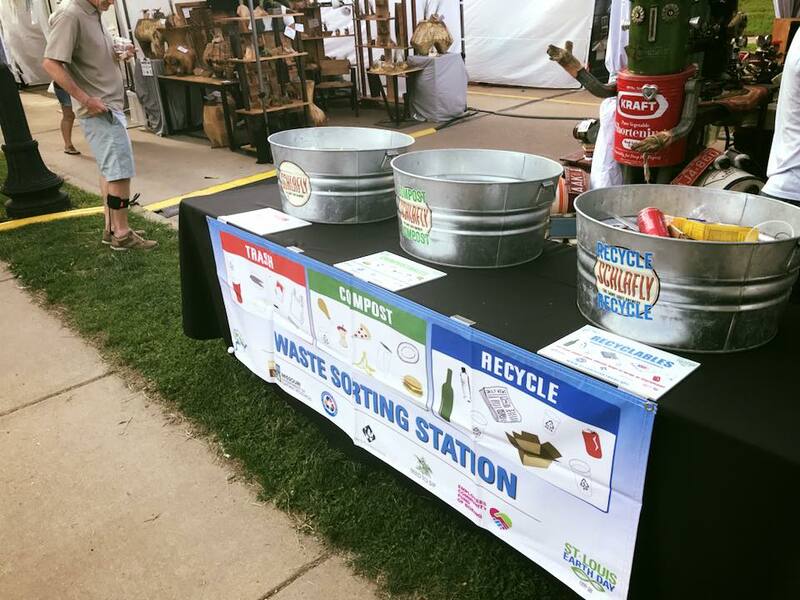 Consider introducing an incentive program, encouraging citizens to bring their own utensils, straws, and cups in exchange for a free drink coupon, discounted food, or entry into a raffle for a fun sustainable prize (reusable shopping bags, anyone?). Easy-peasy! Just add an extra bin for food scraps and those handy compostable plates you just ordered and divert nearly everything at your event away from landfills. One of the biggest causes of waste contamination is laziness--and when people see a recycling bin but no trash bin, guess where their half-eaten soft pretzel is going? That’s right, straight into the recycling bin, likely contaminating that entire bag’s worth of recyclables. Many waste collection agencies also charge a fee for contaminated recycling and compost bins, so this is something you definitely want to avoid. This tip also extends into any office, home, or other place you might go! Worried about the public contaminating the compost? Introduce waste-sorting stations! Rather than scattering bins across your site, have a few well-marked (and staffed) stations with trained volunteers to ensure proper sorting. Worried about funding? Reach out to local green non-profits for volunteers, offering them a booth or poster space to advertise their own mission and events, or enter volunteers into a raffle based on how long they work the station. Encourage citizens to use their own water bottles and cups brought from home (perhaps introducing an incentive system like in tip #1. Make sure to provide well-marked and maintained water refill stations, using public drinking fountains or encouraging food stations to provide coolers with ice water. This can build sustainable habits in individuals for the future! Flying in ingredients from across the world can be exciting and provide a lot of variety--but can also create a huge carbon footprint for your event. Challenge your vendors to use ingredients that not only minimize this impact, but support your local economy. Improve this further by encouraging plant-based proteins as the basis for dishes, which decreases land and water use, in some cases using 10x fewer resources. Some of these solutions have a higher price tag than their less sustainable counterparts, and it can be difficult to change the status quo. But the rewards of being a leader and inspiring local citizens to live sustainably can be tremendous--and why not work towards a better world while we still can? If you aren't in charge of any events with food, reach out to organizations who are and lend them your ideas. Citizen input is valuable and can go a long way. If you don't have time to type out all of your ideas, just send them this post! Now, go! Make the world a better place! Have any tips of your own? Have you done work personally to make your community more eco-friendly? Reach out to us here or on social media for a chance to have your ideas featured with us here at Care About Climate.